Crucial to healing the divide in American politics and society is a willingness to look beyond people’s labels in search of common ground, say Pico Iyer and Mitra Rahbar. Larry King: What about the disconnect in America today? Congress – the Republicans hate the Democrats, the Democrats hate the Republicans, the President-Elect hates the current President. When we see it all around us, and we have the media to explore it, how do you deal with that? Mitra Rahbar: You have to partially disengage and make that decision to disengage. And also I think it’s like we have really compartmentalized so much. We say, ‘oh this is a Republican so it means this, this, this, and this. This is a democrat, it means this, this, this and this. And I think that’s what’s gotten us into a lot of hot water. We have to see a person by the merit on which they stand. Not by the label that media or other people give to them. Because we have phenomenal people who are Republicans, and phenomenal people who are Democrats – So I think it’s also for us to not… you know, Pico says we have to choose not to engage into all of this negative press, and to all this negative press, and that’s a choice that we can put the cell phones down for a few minutes everyday. Larry King: Who does that? Pico Iyer: And people are much subtler than their labels. We all know that we don’t want to be pushed in categories, so it’s silly for us to push other people into categories. Larry King: Do you get desensitized to this. In other words, another shooting today, another shooting, an airport this guy shot up, a hospital – the airports are closed, there’s a bomb threat, ho hum it’s another day in America. Pico Iyer: We do. And I, although I’m a practicing journalist, many years ago I moved from New York to rural Japan. I don’t watch TV there, I don’t have any media, and I still have to be responsible for the news but I don’t want to follow the breaking news which contradicts itself every two minutes. And exactly, I don’t want to be desensitized to what’s happening, so I’ll check in with the news every week rather than every minute. 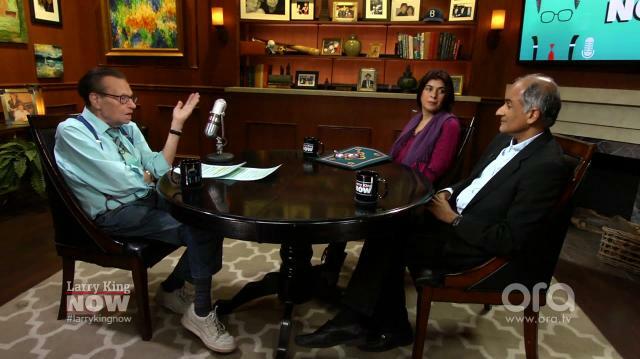 Larry King: Watch new episodes of “Larry King Now” Monday,Wednesday, andFridayon demand on Ora TV and Hulu.